Create a fun, memorable scene in your yard or on your lawn with this Inflatable. It's an eye-catching decoration that requires a minimum of effort to set up. Just plug it in, stake it down and watch the magic unfold. 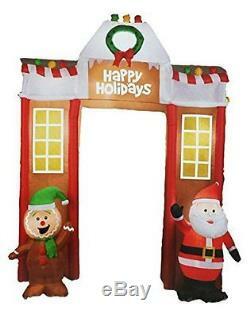 10.5 ft Gingerbread Archway inflatable. Everything is included for setup. Check out my other items. Be sure to add me to your favorites list. GENERAL TERMS & INFORMATION (PLEASE READ): Please ask questions before purchasing. I describe the items in my listings to the best of my ability and try to include all attributes and defects. Many of the items I list come from estate sales, auctions or private sellers. I don't know if, in its former life, an item has been exposed to animals or smoke. My place of business is smoke-free, but not pet-free. All items have been cleaned, but not to an extreme degree because I believe the end user will likely clean the item upon receipt. Please clean item, to your satisfaction, when you receive it. Questions are also handled within these same time parameters- Monday-Friday. 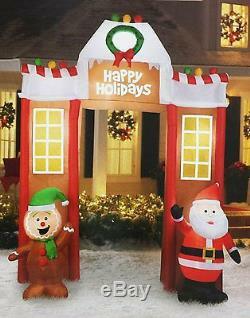 The item "Airblown Inflatable Outdoor Christmas Gingerbread Archway Decor 10.5 Ft Wide" is in sale since Wednesday, December 30, 2015. This item is in the category "Collectibles\Holiday & Seasonal\Christmas\ Current (1991-Now)\Yard Décor". The seller is "shelley8vj5" and is located in Yorkville, Illinois. This item can be shipped to United States, Canada, Denmark, Romania, Slovakia, Bulgaria, Czech republic, Finland, Hungary, Latvia, Lithuania, Malta, Estonia, Australia, Greece, Portugal, Cyprus, Slovenia, Japan, China, Sweden, South Korea, Indonesia, Taiwan, South africa, Thailand, Belgium, France, Hong Kong, Ireland, Netherlands, Poland, Spain, Italy, Germany, Austria, Russian federation, Israel, Mexico, New Zealand, Philippines, Singapore, Switzerland, Norway, Saudi arabia, Ukraine, United arab emirates, Qatar, Kuwait, Bahrain, Croatia, Malaysia, Brazil, Chile, Colombia, Costa rica, Dominican republic, Panama, Trinidad and tobago, Guatemala, El salvador, Honduras, Jamaica, Antigua and barbuda, Aruba, Belize, Dominica, Grenada, Saint kitts and nevis, Saint lucia, Montserrat, Turks and caicos islands, Barbados, Bangladesh, Bermuda, Brunei darussalam, Bolivia, Ecuador, Egypt, French guiana, Guernsey, Gibraltar, Guadeloupe, Iceland, Jersey, Jordan, Cambodia, Cayman islands, Liechtenstein, Sri lanka, Luxembourg, Monaco, Macao, Martinique, Maldives, Nicaragua, Oman, Peru, Pakistan, Paraguay, Reunion, United Kingdom.